Alla Prima (meaning at first attempt) is a fun and satisfying wet-on-wet painting technique. 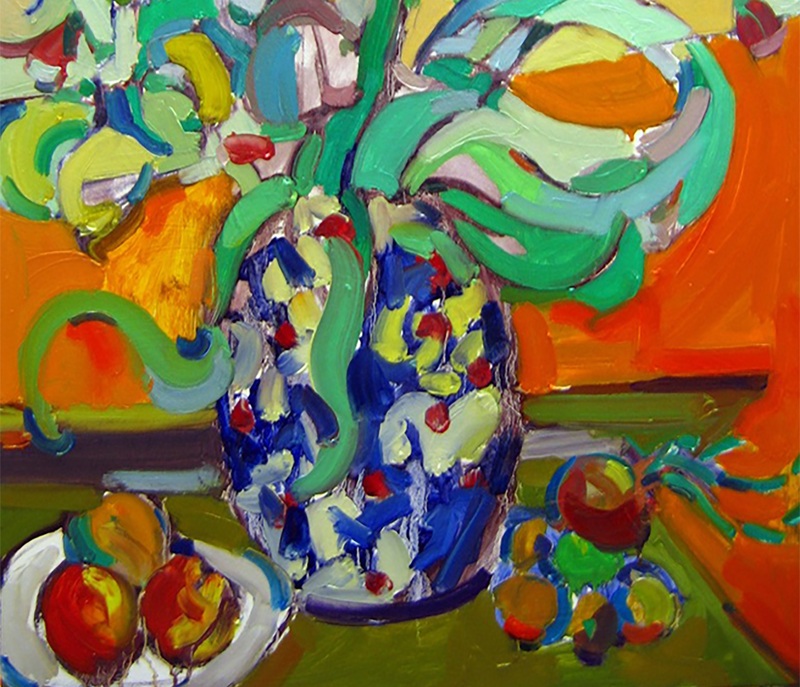 Complete various small paintings working from still life materials using direct observation skills and be challenged by timed exercises that will open your mind to creating fresher, more spontaneous works in oil or acrylic paint. A native of Salt Lake, Dave lived in Japan for two years prior to studying at Utah State University, earning a BFA and receiving an MFA in painting from Colorado State University in 2006. He resides in the Pacific Northwest with his artistically gifted wife Jenny and is a tenured professor of art at Pierce College in Lakewood, Washington. • A palette knife is required. All students must work in oil or acrylic paints for this work shop. Participants are welcome to bring as many colors as they desire-but must have at least the primary colors (red,yellow, blue) plus white and black. It is notable that a set of secondary colors will save time in mixing colors if students are willing to make the investment. In the way of suggestion, due to the speed that we will be painting, student grade paints are acceptable. Such options include Daler Rowney, Winsor Newton, or Blick to name a few. Larger tubes or jars (200 ml) can be more desirable than smaller tubes or jars of paints (37 ml) given the fact that we will be painting quickly and often in thick juicy layers of paint as reflected in the traditional use of Alla Prima practices. • A palette knife is required. Students must also provide brushes (long handled strongly encouraged). Suggested sizes include 2, 4, 6, 10 in a variety of round and flat brushes. Grumbacher Bristlette, though not required, is a great brush for the price. The instructor will provide each student with 6+ painting surfaces, solvents (as needed), a disposal pallet, and paper towels. He will also provide all the still life materials, may of which will be tasty food items that the student can enjoy at the end of each Alla Prima painting.